Does reading a Seed Catalogue feel like Greek to you? 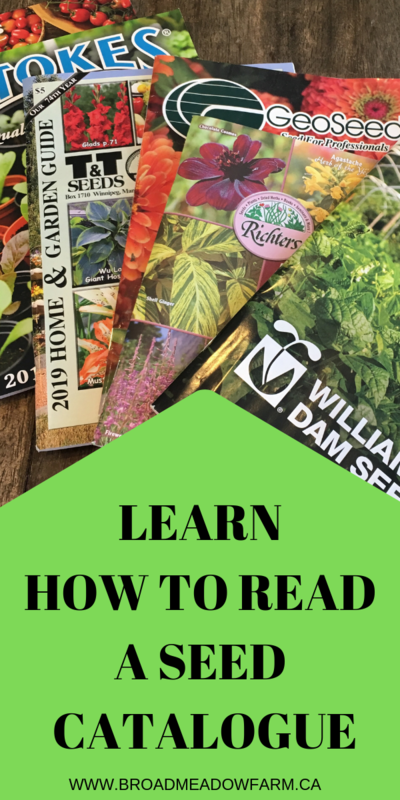 I’ll help you know how to easily read a seed catalogue without getting confused. If you’re new to gardening and the world that is all things plants, then it’s really easy to become overwhelmed with all those pretty catalogues that start coming in the mail late fall and early winter. 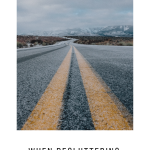 While I love reading through all the catalogues and see the pretty pictures, I have a sure fire way for you not to get seed crazy and overwhelmed. Before you even purchase a single seed you need to have a heart to heart talk with yourself and how you see yourself as a gardener. This talk is reign yourself in. The moment I open that Seed Catalogue it’s game over. My wish list goes from 40 plants to 100 varieties in a matter of a couple page flips. So before I even decide to purchase any seeds, I come up with a game plan. For vegetable seeds I make a list of the veggies that we actually eat on a regular basis. I also try and stick with easy to grow vegetables. When it comes to flowers, you need to know how you’re going to use them. Just for looks? Do you want to have a small cutting garden? Flowers have always been my nemesis. I seem to always find ways to buy more flowers seeds than I probably should. I also give myself a budget for seeds. This way when you’re trying to decide how many varieties to pick you have a limit that works to make that decision for you. So we’ve got our list and our budget. It’s time to open that seed catalogue. There are beautiful glossy photos full of great promise of the most beautiful garden, heaped with a bountiful harvest. We’re prepared with our wish list and our frost dates figured out so that we know how many days we have for growing and a pen to start marking up that catalogue. When you open a seed catalogue, look at the bottom of each page, there should be a legend. This legend will show you the abbreviations each plant section is using. The will help you find Organic Seed, Season Length as well as if the seeds are disease resistant among other things. When in doubt always refer back to the legend and you should be able to clear up any confusion right away. I even called one seed company to get some clarification so you don’t need to. 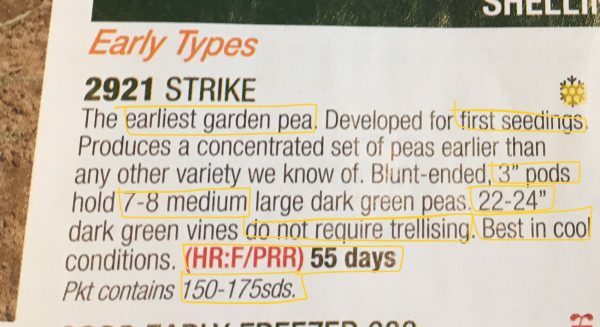 Let’s look at the Description for Strike Garden Peas from the William Dam Seeds catalogue p. 60. I’ve highlighted all the key descriptions in this small listing. The first thing you see is the Snowflake. When I look down at the legend this means that this seed is for Short Season and is Cold Tolerant. The next thing we read is that this is the earliest garden pea and is good for first seedings. When they say first seeding, they mean if you are going to keep seeding in succession through out the growing season to have a continuous harvest of peas, this is the seed you’ll want to use first. Next we read that the pods are 3″ long and hold 7-8 peas. That’s a great size. You’ll be getting a good crop out of these peas! If we keep reading these peas will get 22-24″ tall and they don’t need trellising if you don’t want to. Just because they don’t need it, doesn’t mean you can’t use it if you want to. What are those funny letters? The letters in RED are the disease resistance codes. The letters HR mean High Resistance and IR mean Intermediate Resistance. There isn’t always a legend for these 2 letter groups, so now you know what they mean. The letters following are F/PRR. The F stands for Fusarium and the PRR is for Pythium Root Rot. Those letters are listed below at the bottom of the page. While you may not fully understand these diseases you can rest assured these seeds are resistant due to the HR (High Resistance) listing. If we read on we will see that this seed is a 55 day seed. This means that from germination, when you first see green emerge from the soil, you should expect to see flowers and pods around the 55 day mark. This number is an average day. 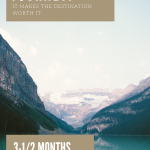 It will all depend on the weather you have had. If you’ve had extended periods of grey and clouds this number may be bigger. The final number in the photo above is how many seeds are in a package. This is the smallest amount of seeds you can purchase. Let’s look at this next photo. This will help us determine how many seeds we are going to need. Each Package will sow approximately 20 ft, 125g sows 50ft, 450g 200ft, etc. So how big a garden do you have? Are you looking for peas to snack on for the season? Are you wanting to process peas and fill your freezer? I aim for about 200 ft of peas. This will give us plenty of peas for eating and about 200 cups of peas to put in the freezer for the winter. So for me I will need to purchase a 450 g (1 lb) bag of seeds. The photo above also has tips for growing these peas. 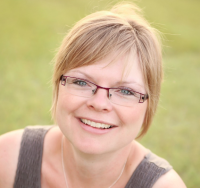 Follow each picture; you will plant the peas 1″ deep, about 2″ apart and then place each row a minimum of 30″ apart. Germination should occur in about 5-7 days as long as the temperature remains at least 10 C. Make sure you don’t over fertilize or the plants will put all that nitrogen into the vines and not into the pea pods. What variety should I choose? So you now know how read a seed catalogue, but you still have to choose what seeds to purchase. 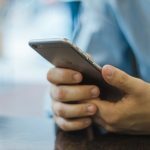 Remember that wish list you created? Now is the time to pull that out. Let’s continue with our Shelling Pea example. I’ve decided that I’m only going to grow shelling peas so I’m not going to even look at the Snow, Sugar or Dry Pea varieties. 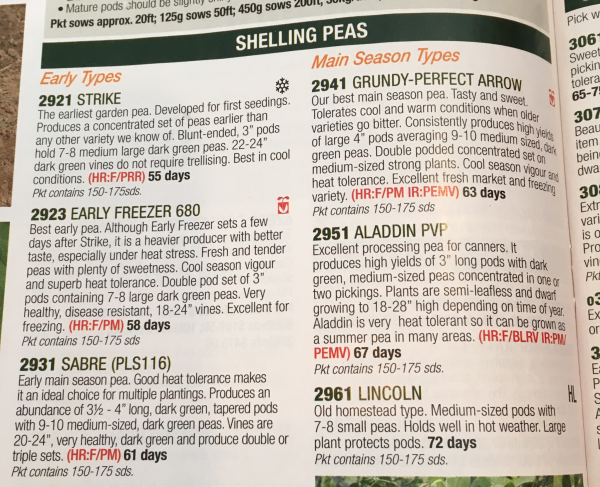 There are 6 Shelling Pea varieties to choose from in this catalogue, so I’ve narrowed my selection down from 21 varieties to 6. From the 6 Shelling Peas I can see that 5 of the 6 are really resistant to disease and in those 5 varieties two have less than 60 days to fruiting. After reading the descriptions I’m liking the sounds of the Early Freezer, Sabre and Grundy-Perfect Arrow. The words that drew me to these varieties is Heavy Producer in the Early Freezer, Abundance in the Sabre and Best Main Season and High Yields in the Grundy. Do I choose only by day length? There is only a 5 day difference between the Early Freezer and the Grundy so that isn’t my deciding factor. The fact that the Sabre and the Grundy have larger pods with more peas is important. If I’m going to be picking peas I want to be able to get the most out of the work that I’m going to be doing. I’m going to choose the Grundy-Perfect Arrow Shelling Pea. It checks off all the boxes I require in a Shelling Pea. Grundy is going to tolerate cool springs and then the heat of the summer. It’s going to give me large pods with lots peas. Plus it’s also rated good for fresh and freezing. If you start with what your requirements are first in a seed you’ll be able to start crossing off varieties right away leaving you with a much smaller selection of seeds to choose from. Now you know how to read a seed catalogue and let the shopping begin. Take a pen and start scribbling in your seed catalogue. Make notes, cross things out. Most of all use this cold wintery weather to dream about Spring and that one day all this snow is going to melt!